Margaret M. Towey - Howard B. Tate & SonFuneral Home, Inc.
Born in Albany, January 15, 1927, Mrs. Towey was the daughter of the late James A. and Mary Ellen (Killion) Briggs and the beloved wife for over 42 years of the late Charles A. Towey Jr. who predeceased her in September 2000. Mrs. And Mr. Towey were married on October 12, 1957. Mrs. Towey was a graduate of the former Cathedral Academy in Albany. For several years she was employed by the NYS Department of Motor Vehicles in Albany before being employed by the Schalmont School District. She retired in 1992. A longtime communicant of Our Lady Queen of Peace Roman Catholic Church in Rotterdam and a member of the Rotterdam Columbiettes, among Margarets many hobbies were her love of playing Bingo with her friends and bowling . Mrs. Towey is survived by a daughter and son-in –law, Kathleen and David Gicewicz of Pittstown and a son, James P. Towey of N. Smithfield, RI, a granddaughter and her husband, Robin and Martin Byrne of Liverpool, a grandson, Dr. Adam Gicewiwz of Albany, a great-grandson, Deacon Byrne of Liverpool and nieces and nephews. In addition to her parents and husband, Mrs. Towey was predeceased by her twin sister, the late Mary Margaret Caldara. 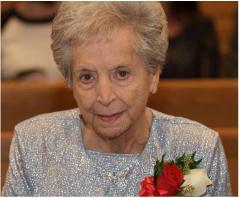 A Mass of Christian Resurrection for Mrs. Towey will be celebrated on Wednesday, October 19, 2016, at 10:00 A.M. at Our Lady Queen of Peace Church, 210 Princetown Road in Rotterdam. Burial will follow in St. Cyril and Method Cemetery also in Rotterdam. Relatives and friends are invited to call from 4:00 – 7:00 P.M. on Tuesday, October 18, 2016, at the Howard B. Tate & Son Funeral Home Inc., located at 2237 NY Route 7, in Raymertown. ​At the request of the family, memorial contributions, if desired, may be made to the Pittstown Volunteer Fire Company, 134 Parker School Road, Johnsonville, NY 12094, in memory of Margaret Mary Towey.